Background: Despite recent improvements in the treatment of rheumatoid arthritis (RA), an insufficient treatment response and the development of treatment resistance in many patients illustrates the need for new therapeutic strategies. Chronic synovial inflammation could be suppressed by targeting RA synovial fibroblast (RASF) activation by, for example, interleukin (IL)-17A-producing CCR6+ T helper memory (memTh) cells. 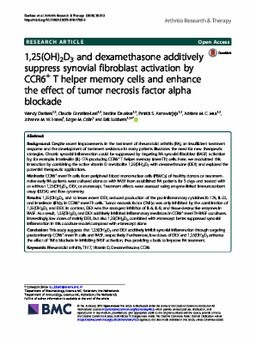 Here, we modulated this interaction by combining the active vitamin D metabolite 1,25(OH)2D3 with dexamethasone (DEX) and explored the potential therapeutic applications. Methods: CCR6+ memTh cells from peripheral blood mononuclear cells (PBMCs) of healthy donors or treatment-naive early RA patients were cultured alone or with RASF from established RA patients for 3 days and treated with or without 1,25(OH)2D3, DEX, or etanercept. Treatment effects were assessed using enzyme-linked immunosorbent assay (ELISA) and flow cytometry. Results: 1,25(OH)2D3, and to lesser extent DEX, reduced production of the pro-inflammatory cytokines IL-17A, IL-22, and interferon (IFN)γ in CCR6+ memTh cells. Tumor necrosis factor (TNF)α was only inhibited by the combination of 1,25(OH)2D3 and DEX. In contrast, DEX was the strongest inhibitor of IL-6, IL-8, and tissue-destructive enzymes in RASF. As a result, 1,25(OH)2D3 and DEX additively inhibited inflammatory mediators in CCR6+ memTh-RASF cocultures. Interestingly, low doses of mainly DEX, but also 1,25(OH)2D3, combined with etanercept better suppressed synovial inflammation in this coculture model compared with etanercept alone. Conclusion: This study suggests that 1,25(OH)2D3 and DEX additively inhibit synovial inflammation through targeting predominantly CCR6+ memTh cells and RASF, respectively. Furthermore, low doses of DEX and 1,25(OH)2D3 enhance the effect of TNFα blockade in inhibiting RASF activation, thus providing a basis to improve RA treatment.